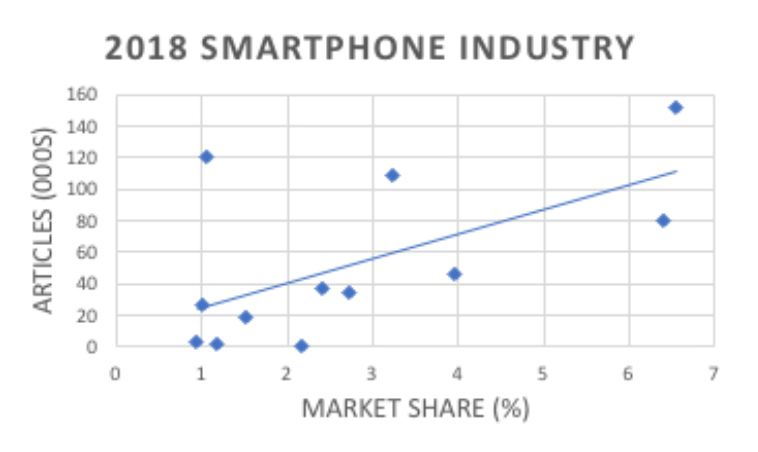 With Samsung set to announce their first 5G-compatible smartphone next week and Apple going on record to say they won’t be bringing 5G to the iPhone until 2020, the smartphone market has never been more competitive. As we barrel towards the retail mecca that is Christmas and on the back of a slew of new smartphone releases, we use the Signal platform to uncover the five lessons you won’t want to have missed this year. Nokia attempted a rebrand in Q1 of 2018, releasing new models and a vintage ‘banana phone’. They saw a big jump in coverage to 10,000 articles in February, but have since plummeted far below their competitors, to under 300 articles a month. The low coverage of the new Nokia 7.1 (only 45 articles on the date of release last month) sums up a pretty fruitless year for the company. Since this time last year, Nokia’s market share in the mobile phone industry has dropped from 2.1% to 1.2%, with no sign of it picking up. Forget the beer and Lederhosen, this year we celebrated the launch of six new smartphones in a single month. All 6 models earned significantly more media coverage on the day of their announcement than they have on average since. Announcement days achieved a coverage increase of 832% compared to an average day, while release day garnered just a 44% increase.Google’s Pixel 3 (green), Huawei’s Mate 20 Pro (orange) and OnePlus’s 6T (blue) were prime examples that announcements offer PRs far more opportunities for coverage than releases. The Huawei Mate 20 Pro and LG V40 ThinQ actually managed to get less coverage on their release day than they have on average since. 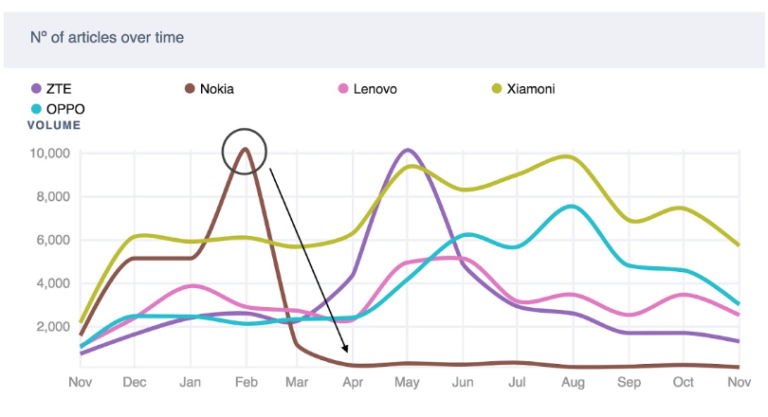 The Mate 20’s coverage was down 41% on October 26th, with the iPhone XR seeing a 122% increase and similar results faced Google and LG on the 18th. This lesson should be pretty obvious: if you want your product to be read about on its release, choose your own day in October, there’s plenty spare. 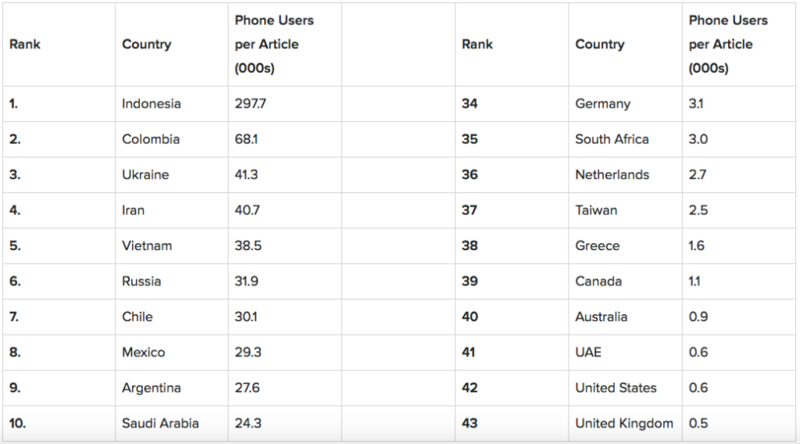 The Indonesian smartphone market is 600x less saturated by media coverage than the UK and US. The country boasts 297,700 phone users per article published about phones, and this has allowed the fastest growing mobile vendor of 2018, Xiamoni, to double its market share in the country to 13.5 million customers with very little competition. It looks like Asia and South America may be the most rewarding markets for smaller brands looking for ROI on their PR efforts. Looking at coverage for the 12 largest phone companies after Samsung and Apple, there is a clear relationship between media coverage and sales, with a moderately strong correlation coefficient of 0.6. The gradient of the trend suggests that increasing your media coverage by 15,000 articles throughout the year would result in an estimated 1% increase in market share, worth $3.5bn. That’s a potential $200k revenue per article. With over 65% of the global population expected to have a phone by 2020, perhaps there are opportunities for newer firms to reap the rewards of unsaturated, fast-growing economies and take over from the failing legacy brands. If you can avoid fruit-based gimmicks and Apple’s release days, we can declare with increasing confidence that it does, in fact, pay highly to be in the news. Interested in how Signal can help you better monitor and understand your industry? Click here to request a demo.